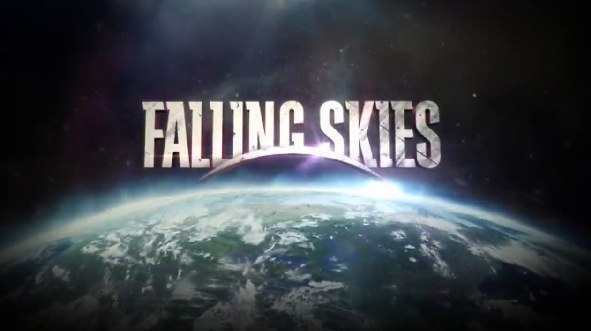 As you probably have already figured out, the Season Ending episode of Falling Skies is this Sunday at 9 PM on TNT. Already renewed for a second season, the show promises some great reveals and some good cliffhangers. The writers have already promised that they would guard against loose plotlines that never resolve. This past weeks episode brought two major possibilities to my mind as to where the show might go. That doesn’t mean that it will, but I feel strongly that some major and surprising pairings may be coming. Ben, Ricky, Matt, and Pope figure in my musings. The first is the pairing of young Matt and Pope. This is the oddest of odd couples, and yet, knowing how it is to be a little brother, this also makes sense. While Matt has been a curious observer, he has not been a part of the action, for good reason. He is young and he is impressionable. He has been fascinated by Ben since he returned, and not for the same reasons that Hal has been observing. Matt may see the push-ups and all, but his mind reaches back to the harness remains. He sees his brother, but does not understand what may be different. In addition, Matt has been give busy work with Porter, work that would normally interest a kid, but not with all the other activity and excitement around him. 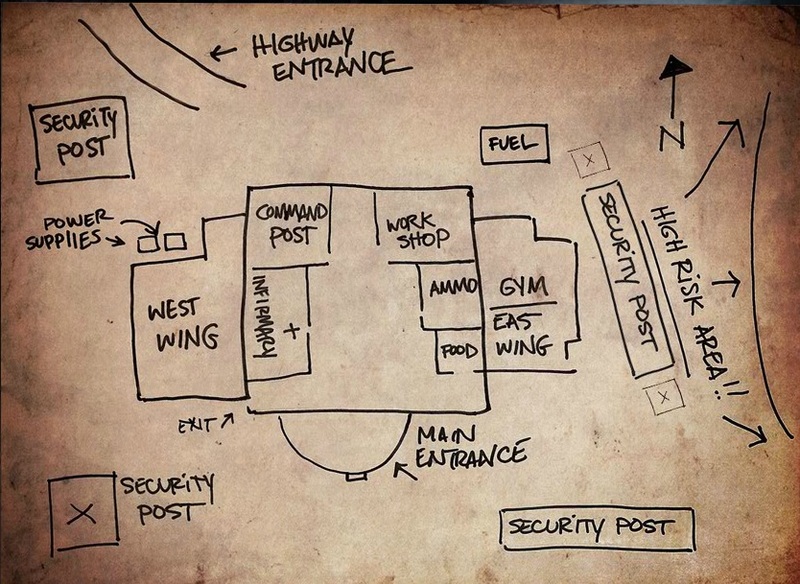 Despite the horrors of the escape from the initial invasion, we’ve mostly seen Matt work out his thoughts through drawings and conversations. However, while in the lab this week, Matt reacted as strongly as we’ve seen him when Pope opened up one of the MECHS and it blew a hole in the wall near Matt. Matt understandably ran out of the room, but while fear was a factor, his curiosity soon took over. Matt returned to the lab later and began asking questions of Pope. While first affecting a bit of a “WC Fields towards kids” attitude, Pope eventually started to build a bit of a bond with Matt by explaining what he was doing. In addition, Pope did not talk down to Matt, he explained it much as he would to anyone else Pope would decide to tolerate. In a later scene outside, Matt may be the most excited when Pope shows what he has developed to pierce the MECH’s shell. His cheering and smile shows that he feels he shares in the discovery and seems to lead Matt to be hero worshipping Pope. Of course, the danger here is that Matt also feels out of the action and Pope has given him an opening to feel, and maybe be, included. If this is true, it also allows for Pope actions to actually have consequences beyond his own personal life if it possibly endangers Matt. Spielberg’s films have always been about the “boy” in someone. Either it was a boy as the lead, or a man finding his “inner boy” again. 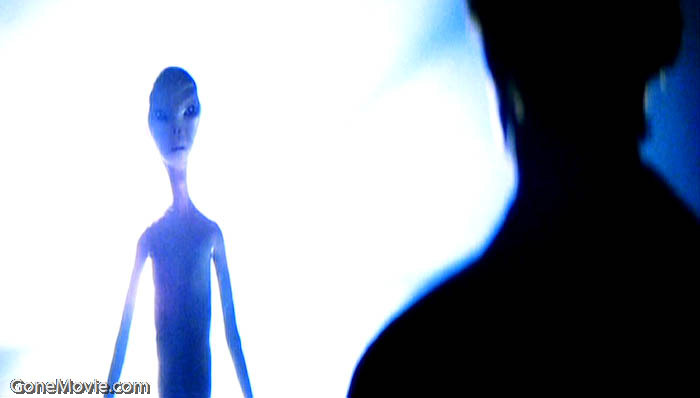 While ET is obvious, CLOSE ENCOUNTERS OF THE THIRD KIND is more subtle but effective in this. Roy Neary, played by Richard Dreyfuss, is still a boy in a man suit. His train set has a Jiminy Cricket music box in the middle, he is excited about taking his kids to see PINOCCHIO (his kids want to play Goofy Golf), and he gets a childlike drive and determination as he tries to discover what is going on with the strange lights and occurrences. He is fascinated by the possibilities, not scared of the consequences. He is seeking his own Monstro The Whale. So knowing the “inner boy” in Spielberg, it wouldn’t surprise me to see a way to work a boy’s fascination combined with his frustration of being just a “little brother” into the plotline. Matt just may have found a way to be included in the action. Then we have Rick and Ben. As I’ve previously noted, up until a couple of episodes ago, Rick was not really an important character. He was the first kid we saw the harness removed from who lived. He wound up simply recuperating. However, at the end of one episode, we saw his eyes pop open in response to some sort of stimuli from the captured Skitter. Those eyes would become very telling and important as the show progressed, as would Rick’s role. Rick now figures to be a major point of conflict. We’ve already seen his seeming rejection of his father’s affection, his cool reaction to his father’s death, and his constant attention to Ben. He talks as if he is not one of the 2nd Mass or even of the human race anymore. His answers include “We” but that refers to the aliens, not the humans. 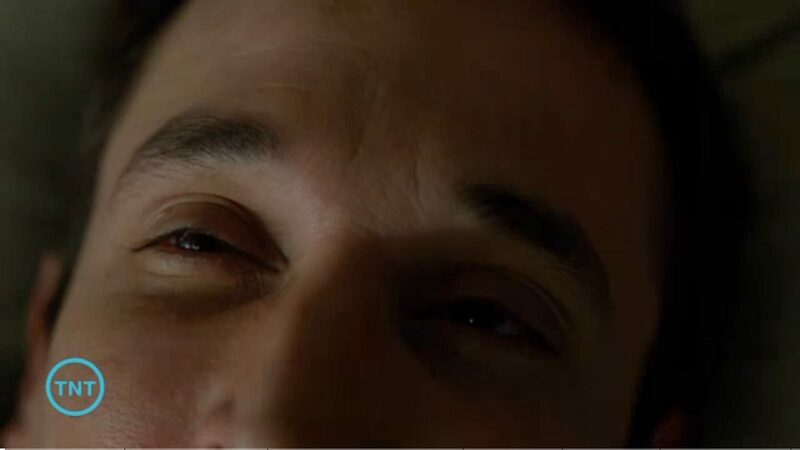 In addition, his eyes never seem to attempt connection with anyone other than Ben. Up to this point, we’ve seen Ben seemingly try to simply ignore or gloss over Rick’s conversations with him. However, in this episode, Ben reacts angrily to Rick’s description of his feeling for the aliens and proclaims his hated of the Skitters. This may signal a change in Rick’s relationship with Ben. When Pope demonstrates the ammo he has developed to take down the MECHS, you see Ben noticing that Ricky seems to be leaving with some urgency. You don’t know why, but you assume that Rick is going to inform the aliens about what is taking place. After all, he really had an unhappy, sickly childhood, seemed distant from his father, and has no other family in the 2nd Mass. He seems to get that feeling from the Skitters. So the assumption is that he is running to inform. The complication is that Ben has seen him leave. This goes beyond simply informing his Dad that Ricky left. Ben knows Rick’s true feelings and has not shared them. That could lead to Ben trying to go after Ricky himself. In addition, we know that Ben has been getting “bigger, stronger, faster” and Ben has noticed , too . He doesn’t seem to understand why, but this may become clear very soon. I am wondering is this leads to a confrontation between Ben and Rick. We really haven’t seen Rick showing signs of increased strength, so beyond an informant role, what would the Aliens need with him. However, Ben might hold more promise for the Skitters and their overlords. He seems to be the one they want. Rick seems to know that, as well. Could this cause Ben to go off after Rick, and instead of a confrontation with the aliens, Ben to have a confrontation with Rick? Again, we’ve seen no increase in strength, but Rick is so guarded, he may simply have not shown it yet. Could a major fight be brewing between these two, a good vs. evil affair that will affect Season Two? That’s my thought, and if it happens, it would be a great twist in a genre that usually depends on blowing things up to wow you. As for the rest of last weeks episode, there were also a couple of other possible questions raised. We got to see much deeper into Weaver. We learned much more about his family and where he lived, and also learned that he has been hiding away with booze and pills. When Ricky draws what seems to be the block that Weaver lived on, Weaver notices. That plays a part later on. Tom, Hal, and Weaver plan for a nationwide co-ordinated assault on the huge construction looming over the city. This structure, and the way they describe it, looks like a giant “alien erector set”. They also get a first look at what seems to be the aliens controlling the invasion when they witness three Skitters “bowing” when a group of very tall, two legged aliens approach. This is the first hint of new enemies to battle. As they survey the area, they meet what has been described as a “crazy tea lady”. While she aggressively keeps an eye on the area, she also seems to be more. She was originally kept in a remote area with others, but was released when they had no more use for her there. Could this remote area be the Blue Hills Ski Area that has been seen as backpack patches a couple of times? Is that area a holding area? Tom tries to find out info, but is interrupted when Weaver takes off on his own. Weaver has left to go home. Rick’s drawing has drawn him back there, back to the horror and the memories. Tom follows him there and gets Weaver to open up about what happened to his family. In addition, it is obvious that Weaver is drowning his grief in booze and pills, and might be becoming useless. However, when a MECH suddenly shows up at the house, Tom and Weaver must take it out, but how? Weaver seems to be incapable of helping until he spies his wife’s glasses on the floor. At this point, he comes out of his stupor, and takes charge of a plan to destroy what seems to be an indestructible MECH. Successfully doing this, the question become how the MECH knew they were there. It becomes obvious that “Crazy Tea Lady” has been informing the aliens of their whereabouts. They go back to confront her, just as a knock come on the door. It is harnessed Karen, who is asking for information and bringing her foodstuffs and tea. Hal sees Karen through the door’s peephole and wants to make a grab for her, but Tom stops him. Wise choice. With Karen is one of the new aliens, who seems to be skeptical when Cat Lady says there is nothing to report. The alien looks into the peephole from outside and then leads Karen away. When Tom, Hal, and Weaver get back to the school, Hal says he will go after Karen at the first possible chance. In addition, Weaver tells Tom that the glasses are his wife Linda’s. He also says that they were not there when he went back a week after the attacks, so he now harbors hope that his wife and daughter are still alive. This also touches a thought that I’ve always had, but probably is not realistic. Here goes anyway. What if some of those they assumed had died, really didn’t? What if some of them, most possibly the mothers, had instead been captured. Cat Lady could have been released from the camp because she was childless. Could others still be held at that camp? Just sayin’. There are a few other scenes, most notably when Anne tries to discover more about Ben’s spikes. This leads to her and Lourdes performing an autopsy on a dead Skitter and discovering what seems to be a body system that seems to be similar to humans, as well as a harness inside the Skitter. This of course seems to support the theory that Skitter are human transformation. I am not completely sold on this theory, and it wouldn’t surprise me if this becomes a red herring. But I’ve been wrong before. So you have some new intrigue: Ben and Ricky possibly building to a confrontation, Matt and Pope as an unlikely “team”, Hal possibly feeling the need to save Karen, and Weaver with newfound reasons to win this battle. Add in Tom and the rest of the 2nd Mass, and you have the ingredients for one hell of a season closer this Sunday. 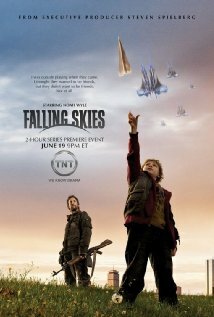 While I’ve really enjoyed FALLING SKIES over the first 5 episodes, you knew that they eventually had to advance past where they were in terms of story, location, and combatants. With last week’s Episode 6 “Sanctuary Pt.1”, we start to expand scope. The episode saw a number of tonal changes, new characters, increased shades for the current characters, and the feeling that what had been the main focus so far was about to be upended. Again, I don’t want to do recaps. I want to entice and excite you enough to both watch the show and to join in the conversations. Possibly the biggest growth arc is coming from Dr. Anne Glass. Originally the medic who home based at the camp and worked to save lives in an unaccustomed role for a pediatrician, Dr. Glass has moved far into the “She’s Got Balls” territory. While action outside of the school has been the domain of Tom, Hal, Anthony, Dai, and their small unit, the action inside the school has almost all come from the medical staff. Dr. Glass (the great Moon Bloodgood) has had to move far beyond the Hippocratic oath. She has had to kill a captive Skitter to prove that it could be done by hand. She has had to confront the first bubbling signs of unrest and fear from the civilians, who up to now essentially served as background. She has had to make the moral and ethical decisions when a scared father demands drugs and supplies so that his family can flee. And she has had to embrace the hardest thing a doctor who is trained to save lives has to do: Learn how to take one, by way of Margaret finally convincing her to take a gun. All of this is against Anne’s nature. In addition, Anne now balances at least three storylines: With Lourdes, she is the medical staff. With Margaret, she is learning how hard it might be to keep her beliefs in the face of danger. And with Tom, she may be moving into a closer relationship. In normal life, these would be a complication. In the new world order, one where rules of life are being rewritten day by day, they are almost inscrutable at times. Move over, Tom Mason. 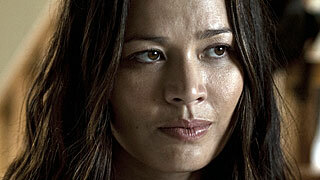 Moon Bloodgood has brought the spirit of Ripley from the ALIEN movies to the show. Moon has built an amazing character portrayal. We also see the disadvantage of the inability to communicate beyond your own camp. There is no real way of knowing who else is really out there fighting the skitters. 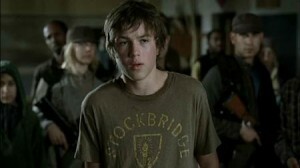 As Eli and his family run from the compound, they are stopped by Clayton, from the 7thMass. He convinces Weaver to let the family go after retrieving the drugs. Clayton also brings news of an impending attack on the compound. Up to this point, the battle has been taken to the skitters. It is assumed that the compound has been able to lie low enough to escape notice. Clayton tells of destruction in the 7thMass, and that he has a safe haven for the kids. Supposedly, this would allow the kids to remain safe from the impending attack. The problem is that many of the kids are in the civilian ranks, from families who so far have remained passive. This request stirs the first real seeds of unrest and rebellion from the civilians. Being told that will have to let go of their children, even for a short time, causes some to soapbox and vent about the commands from the resistance leaders. This unrest is only heighted by the presence of Ben, as well as Ricky and the other saved harnessed kids. They start to feel resentment and anger directed to them because they have been saved while other kids remain missing or have been killed. This shunning is palpable. In addition, the readjustment of Ben back into family life feels a bit foreboding. It is obvious how close Ben and Matt are, and they act just like brothers, goofing and playing around. However, it cannot escape Matt that Ben has the remnants of the harness still in his spine. This fascinates and scares Matt and only serves to heighten his hero worship of Ben. Hal is also part of that brotherly love, even choosing to keep the brothers together as Clayton leads the kids away. For his part, Ben seems to harbor a strange longing for what had happened, as well as a definite ache in his heart for his late mother. Ben seems glad to be home yet lost in the stars. 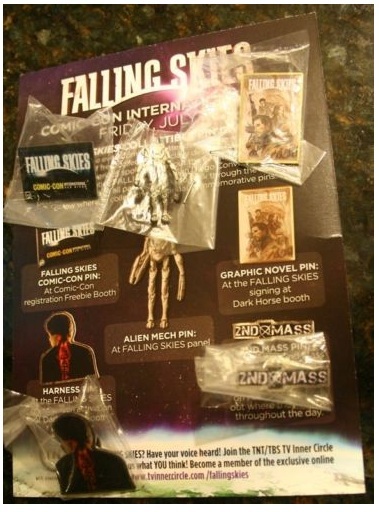 This makes it even more interesting about what life was truly like with the Skitters. In a nice little subplot, we get to see Weaver bond even more closely to Jimmy, advising him to keep it frosty as a sign of support and as close to emotion as Weaver may publically allow right now.. It all comes back to Clayton in this episode. Everyone I talked with on Twitter shared the feeling that something wasn’t quite right here. I was curious about the name 7thMass, since the name 2ndMass was not an assignation but was simply way the leaders there decided to name it. Was there a 1st, or 3rd thru 6th? Also, what was this sanctuary? Why was he the only one who made this trek to the 2ndMass in spite of danger from Skitters and Mechs? Why did one Skitter and Mech show up that night, instead of an onslaught of them? As we find in the story, there is good reason to question his motives. As he leads the kids to sanctuary, it is also revealed that the kids are simply bargaining chips for some sort of survival, a pact with the Skitters or whoever is in charge of the Skitters. In addition, we find that all of his info has come from the captive John Pope. Was Pope giving the info under duress, was he saving his own skin, or was he also conned by the prospect of “sanctuary”. Since this was Part 1 of a two-part episode, it is obvious that many of these questions will be answered or at least acknowledged in Part 2. 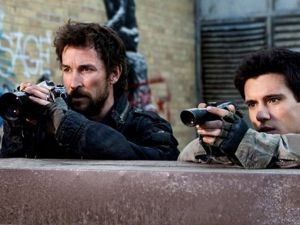 However, this episode begins the next phase for FALLING SKIES as it moves beyond the compound and saving Ben. It now escalates to the greater enemy, one that may come from those who command the Skitters and Mechs, one that may come from using the kids against basic human emotions, and one that may come from a greater understanding of just what will happen to the kids. Hints were made of a major jolt as a new alien is revealed and as the story starts to spread out through the more complicated storyline. PS: Thanks to @kimmyxoxo on Twitter for being the eagle eye who noticed a BLUE HILLS SKI AREA patch on Eli’s back pack. This will probably loom large going forward.